Welcome Centre staff are here to help. Whether you're a new student, a visitor to campus, or an alumnus, the Welcome Centre is your first point of contact in navigating the University of Victoria. It's also a great place for current members of our campus community to meet with friends, study in small groups or relax and unwind. 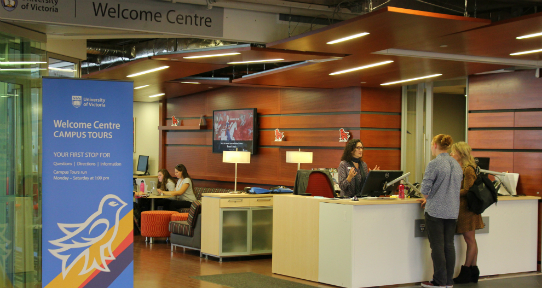 Located on the first floor of the University Centre, the Welcome Centre is open on Monday to Friday from 8:30 a.m. to 4:30 p.m. Drop by if you need help finding your way around our campus, have a question about UVic, or are simply looking for a friendly face! The Welcome Centre offers daily campus tours led by current UVic students, and group tours for visiting high schools. Alternatively, you can visit us during business hours to request a copy of our self-guided walking tour. Meet with a recruiter to talk about becoming a UVic student. Drop-in appointments are offered from Monday to Friday on a first-come-first-serve basis. Register at the Welcome Centre reception desk. You can also book an appointment or phone call in advance. The Welcome Centre offers employee tours for new UVic faculty and staff every other Wednesday at 2:00 p.m.